The notion of $\alpha$-topological vector space is introduced and several properties are studied. A complete comparison between this class and the class of topological vector spaces is presented. In particular, $\alpha$-topological vector spaces are shown to be independent from topological vector spaces. Finally, a sufficient condition for $\alpha$-regularity of $\alpha$-topological vector spaces is given. Al-Hawary,T. $\omega$-generalized closed sets, Int. J. Appl. Math. 16 (3), 341-353, 2004. Al-Hawary,T. Generalized preopen sets, Questions Answers Gen. Topology 29(1), 73-80, 2011. Al-Hawary,T. $\rho$-closed sets, Acta Univ. Apulensis Math. Inform. 35, 29-36, 2013. Al-Hawary,T. $\zeta$-open sets, Acta Scientiarum-Technology, 35(1), 111-115, 2013. Al-Hawary,T. Decompositions of continuity via $\zeta-$open sest, Acta Universitatis aplulensis 34, 137-142, 2013. Al-Hawary,T. $\epsilon$-closed set. To appear in Thai J. Mathematics. Al-Hawary, T. and Al-Nayef, A. On Irresolute-Topological Vector Spaces, Math. Sci. Res. Hot-Line.5, 49-53, 2001. Al-Hawary, T. and Al-Nayef, A. Irresolute-Topological Vector Spaces, Al-Manarah J. 9 (2), 119-126, 2003. Al-Hawary,T. and Al-Omari, A. Between open and $\omega$-open sets, Ques. and Answer. in GeneralTopology 24, 67-77, 2006. Al-Hawary,T. and Al-Omari, A. Decompositions of Continuity, Turkish J. Math., 30 (20). 187-195, 2006. Al-Hawary,T. and Al-Omari, A. Generalized $b$-closed sets, Mutah Lil-Buhuth Wad-Dirasat5 (1), 27-39, 2006. Crossley, S. and Hildebrand, S. $\alpha-$closure, Texas J. Sci. 22, 99-112, 1971. Crossley, S. and Hildebrand, S. $\alpha-$topological properties, Fund. Math. LXXI, 233-254, 1972. Ganster, M. and Reilly, I. A decomposition of continuity, Acta Math. Hung. 56 (3-4), 299-301, 1990. Jarchow, Ph. Locally convex spaces, B. G. Teubner Stuttgart, 1981. Köthe, G. Topological Vector Spaces I, Berlin-Heidelberg, 1969. Maheshwari, S.N. and Thakur, S.S. On $\alpha$-irresolute mappings, Tamkang J. Nath. 11, 9-14,1980. Takashi, N. On $\alpha$-continuous functions,Časopis pro pěstování matematiky 109 (2), 118-126, 1984. ISNAD Al-Hawary, Talal . "$\alpha$-Topological Vector Spaces". 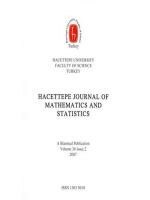 Hacettepe Journal of Mathematics and Statistics 47 / 5 (October 2018): 1102-1107.